Thicker cuts of dried salted fish should ideally be soaked for 10 – 12 hours, in several changes of water to allow the salt to properly leach out. If you need to speed things up, pour hot water over the dried fish and let it soak for about an hour. Change the water a couple of times. When the salt fish has softened enough to slice easily, cut or flake it to the size you want. Rinse, and drain. Meatier fish like king mackerel may need to be cooked briefly to soften it. Add a little turmeric to the cooking water. Shrimp need careful picking through and cleaning to make sure no grit remains. Trim the ends of the bitter gourds, then slice down the length. If the seeds are tender, leave them in. Otherwise, scoop them out and slice the gourd into even half-rings about 1/2 cm thick. Parboil the bitter gourd to rid it of some of the bitterness. Do not overcook. Drain and set aside. Heat the oil in a deep pan, kadhai or wok. Add the onions and slit green chillis. Fry till they soften. Add the bitter gourd, fish, and all the dry spices. Mix thoroughly and cook on medium heat for 3 – 4 minutes. 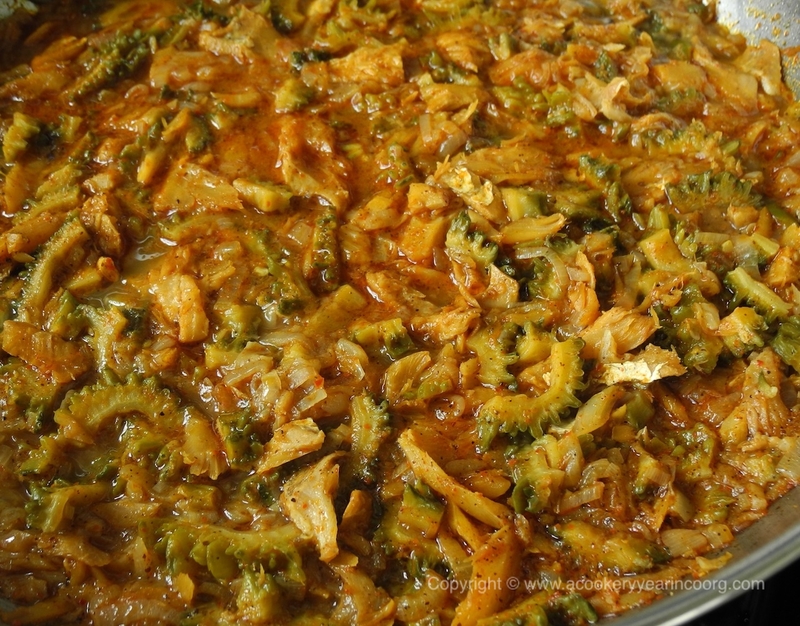 Add two cups of hot water, cover, and cook on medium-low heat for 20 – 25 minutes or until the fish and bitter gourd are tender, and the onions have broken down to thicken the sauce. Add more water if necessary. Check if additional salt is needed, then add the tamarind (I prefer tamarind in this dish) stir, and cook for a few more minutes. Best eaten with akki ottis or steamed rice. For a delicious vegetarian option, follow the same recipe (minus the fish, of course) and add a few cloves of crushed garlic along with the onions, and 2 – 3 tbsp of jaggery towards the end of cooking. Vary the ratio of bitter gourd, onions and fish to your taste. I like to use equal quantities and the result is surprisingly mild.